Rode about on white horse. And it didn’t take long for the crowds to be gone. Dragging women out screaming and calling them whores. And go back in the house to check under the bed. Only tied to a stake could they cleanse you a turn. That before the bonfires, we’d learn for ourselves. Of what you’re meant to be. Because there’s nothing to fear if you’ve nothing to hide. Just go out and don’t talk of it over a beer. And hope that their spying adbots can’t get in. 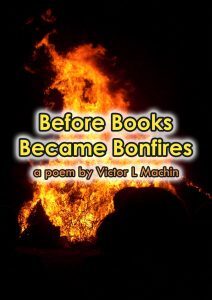 Before books became bonfires, burning bright, burning tall. In great poems remembered the way they were sung.